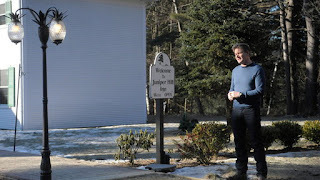 In this Hotel Hell episode, Gordon Ramsay visits Juniper Hill Inn, a 110 year old hotel in Windsor, Vermont, owned by Robert Dean II, an antiques dealer and his boyfriend Ari Nikki. The hotel has been filled with antiques, the prices are high, there is a minimum of a two night stay and Robert still lives luxuriously despite being deep in debt. He lets his friends dine and stay for free, refuses to pay the tips and struggles to pay wages. Gordon arrives at the hotel and is impressed by the beauty of the hotel but finds that the front door is locked. Robert informs Gordon that they are lucky to take $15,000 a month and are losing $200,000 a year.Gordon goes up to his room but it smells like sewage so he asks to be moved to another. He goes down for some lunch but they only serve meals during the day upon request. Gordon notices there are no prices on the menu and Robert explains that they run a fixed price menu of $59 for 3 courses. Gordon orders the crab cakes, they are small, taste like soap and the lamb at an extra cost of $15 is raw and sickly sweet. The only part of the meal Gordon likes is the dessert but discovers that this is bought in. Gordon is shocked to learn that the pair live in a flashy $100,000 RV motor home parked outside the Inn that is a drain on morale as they are living on the poverty line. Gordon leaves the hotel to visit the former chef Ida. She explains that Robert stopped answering the phone and lost his way, he invites her to return at the end of the transformation but she politely declines. Gordon returns to speak with the staff and they tell him that they aren't being paid on time but the basement is overflowing with hoarded antiques! Gordon gets Ari alone for a chat and he tells Gordon that he has sunk his entire life savings into the Inn. Gordon arrives to witness a dinner service and as the pair seat everyone at once there is chaos in the kitchen and it attempts to send out burnt food. After the terrible dinner service, Ari decides to take the reigns declaring himself the boss but Gordon tells him he has no right until he starts paying the staff, Robert's response is to tell them that they don't have to work there. Ryan reveals that Robert has allowed his friends to stay at the hotel for free and takes a portion of the servers tips. Gordon confronts Robert and persuades him to call his friends, they reveal that they did pay tips but it appears Robert pocketed them. Gordon comes up with a plan to persuade Robert to sell off his antiques collection but an auctioneer assesses his antiques to only be worth $25,000. Gordon tells Robert that his staff will leave if something isn't done soon and gives him the bottom line, if he isn't willing to listen to his advice he should sell the inn. The next day Gordon assembles guests to give their opinions on the hotel, Hotel inspector Stephen says that the hospitality is nice but he has nothing else nice to say. Gordon asks Chef Giulian to cook three new dishes of his own and they will present the new dishes to Robert, he loves them and is surprised when he discovers that Giulian created them. The owners gather the employees and apologise for not paying them properly or giving fair tips. Overnight, Gordon transforms the hotel, the great hall is now a warm and welcoming and the dining room is updated. Gordon has left the rooms untouched as they were already to a good standard and the second dining room has been transformed into the Blue Bar. To relaunch the hotel, they are to do their first Sunday dinner service. The relaunch is a success until Sarah asks Robert and Ari's poodle to leave the bar and an argument breaks out. Gordon tells Sarah to go back into the other room and tells Ari that he needs to apologise for raising his voice. Giulian struggles at first, failing to communicate with his sous chef but after a pep talk is soon back on track. The locals and the hotel inspector recognise the improvements that have been made. Yelp reviews were mixed after filming and restaurant reviews after filming were mostly positive but the hotel went into foreclosure with debts of $1.1million in April 2014 and has since closed. They posted on their website that they are no longer in business. Ari was arrested in July 2015 for assaulting a police officer. The hotel was bought by Kenni Lucci and sister Brenda Bradley in 2015, they say that the place was left in a state of disrepair and there were boxes of unused merchandise. The hotel reopened as the Windsor Mansion Inn and Trip Advisor reviews are excellent. Juniper Hill Inn aired on August 13 and 14 2012, the episode was filmed in February 2012 and is Hotel Hell season 1 episode 1 and 2. Most of the hotels/ restaurants Ramsey visits in his programmes are already up against the wall with the amount of debt they have so even if he can help turn it around it may already be too late. Also the fact that these places got so bad in the first place suggests even with help these places are probably less likely to take advice into the long-term. The question you need to ask is how many stayed open that would have shut down without his help, rather than how many stayed open in total. Actually, only this season of Hotel Hell had closures. The hotels in the other two seasons are all open. Also what the person above me said regarding all these places already being in a terrible spot. Agreed with Brittany and the person above, the key here is consistency. I frankly did not find anything wrong with the changes made by Gordon or his recommendations, but am sure that the inns/hotels that were closed probably did what Gordon said for a couple of days but then you can't always force yourself to be someone you are not. And these are places that had existing conflicts within the administration and/or staff plus the debt and lack of rigor (in following the best practices), closure is the result. .... but even though Dean & Nikki failed, the new owners appear to have followed Ramsay's recommendations, and the place is much busier. Ramsay's initial judgement that Dean was clueless, and Nikki too stern a personality to be a host, appears also to have been spot-on. Yeah Greg, unless you look at the facts, you're totally right! How do middle aged men start all over again?? Especially Ari who invested everything and on foreclosure probably owes well over $1million. The funny thing about this is how much they pretty much hoodwinked Ramsay. The cost of those cargo containers alone are between 5-8000 dollars each. Notice how he didn't do an evaluation of the stuff in those cargo containers? I bet he was told that the stuff in the containers don't have anything to do with the business There is probably over 200,000 dollars worth of stuff in there that they rorted from the business by having stuff bought through the hotel itself. I'd have a tax inspector do a proper audit of the entire hotels books. I'm betting they sold all that stuff off in the containers and pocketed the whole lot. That dude reminds me of a sociopath the way he manipulates the situation. I have about 8 of those cargo containers left. The going price is 1600 - 2200 Canadian. Oh at last someone noticed that as well. I kept mentioning to my friend that the guy was ripping the place off and most of the money went to stuff that was in the cargo containers. How did Ramsey and his crew not question the value of the stuff in those containers? I also noticed he was so manipulative and deceitful in his manner with others that'd put money down that he was a sociopath. His boyfriend is someone that would have to watch his back with him. I'm doubling down the bet that his boyfriend ends up in lethal trouble with him. Anyone want to report a tip to the tax office that there was tax fraud afoot? Anyone know where him and his boyfriend are? Of all the Ramsay episodes of various themes, this is the one I seriously questioned the authenticity of. The staff almost "delivered" their lines with the quality of professional actors. The maintenance-man especially...he seemed too savvy to have ever been roped into working for (practically) nothing. One of the wait-staff was educated and absolutely gorgeous - yet apparently couldn't get a paying job elsewhere. All strange and very suss. I actually stayed at this place recently. The owners from this episode apparently locked the doors, and just left one day. It sat abandoned for three years. The new owners said there were three year old dirty dishes still in the sink when they took over the place. Wow, thanks for adding this. Really interesting to hear. well this is the sad fact. Jusy finished watching this episode and wow! Sad how Ari and Robert just ran away. I actually had hope for them. I wonder how the staff is doing now. I didn't have any hope for them. Any person that can say i will not pay my workers is worse than corrupt;They lack empathy and in a service based around serving people that is a death sentence. Ari started yelling at that lady and Robert giving a paycheck on camera when being nationally watched is a far cry from when behind a locked door. Wow I actually had hope for Robert and Ari )^': I just finished watching this episode and was feeling sympathetic for them! The fact that they ran away is horrible! I wonder how the staff is doing now. What happened to the pigs!? this property certainly earned the title "Hotel Hell", I felt so sad for the staff. I was just laid off and just started getting unemployment, the "bankrupt" state of Illinois will pay me $352 a week after taxes, $15 a week more than the job that laid me off last month. I hated these owners since they were snobs that hoarded junk instead of paying their employees. They deserved to go under. Glad to see that the new owners are doing well and I hope they hired the help from the Juniper. They deserve good bosses and a pay check.